Jacob deGrom had one of those starts where he wasn’t at peak deGrominance, but he wasn’t terrible. In fact, he was pretty efficient early on. Through four innings, the righty had only thrown 49 pitches and really only made two mistakes that came back to bite him. The first was a fastball he left over the middle of the plate to Carlos Gonzalez, who took it to the opposite field. Of course this wasn’t all of deGrom’s fault. Although the ball was hit hard, the route Michael Conforto took wasn’t the best. You can say the air in Coors helped the ball carry over his head, and that is why the youngster misplayed it (much like he did on Friday night), but this play put CarGo in scoring position with a double. The second mistake was made two batters later, when he missed his location on a 1-2 fastball. The pitch, which Kevin Plawecki set up for around DJ Lemahieu’s shoulders, was left over the heart of the plate and LeMahieu took into right, scoring Gonzalez. In the fifth, deGrom saw an inning quickly go from requiring only seven pitches, to walking off of the mound having thrown 24, and that came from a blooping dinker of a hit by opposing pitcher Tyler Chatwood that landed just out of the reach of Alejandro De Aza. After this play, the Colorado Rockies really started getting to the pitcher—Carlos Gonzalez in particular—and deGrom would be chased from the game after recording two outs in the seventh. His final line would read something like 6.1 innings, four hits, three walks, three strikeouts, and three earned runs. Of course, one of those earned runs would come on a Ryan Raburn pinch-hit homerun off of Jim Henderson, so decipher that as you will. I just choose to think baseball is stupid and hates us all, probably. The thing that might be a little worrisome is that deGrom was sitting generally in the low-90s all game with his fastball. I was holding out some hope that it was just because he opted to use his sinker more in an environment that sinkers seem to thrive in, but alas that was not the case. Out of the 49 fastballs he threw, only one was a two-seamer—so clearly my hypothesis was wrong. As far as max velocity goes, deGrom touched 94 only two times—once in the fifth and once in the seventh. That is alarming, but so is the fact that he really didn’t miss many bats all day. In terms of his fastball, deGrom was only able to generate none whiffs all day out of the 102 pitches he threw and 54 swings the Rockies had. A 16.6% whiff/swing rate isn’t terrible, but it is certainly lower than what we’ve seen from deGrom. Either way, without his best stuff, deGrom still had a reasonable amount of success. Should we be worried about his drop in velocity? Maybe, but one start is too early to tell. Especially when that one start is Coors field. Going forward, however, I think it is certainly something to watch for. The scoring got kicked off in the second inning when Yoenis Cespedes clobbered an 0-2 fastball into the bullpens in right-center field, and would pick up again in the very next inning. Eric Campbell led off with a double down the line, then deGrom went up the middle to knock in his first RBI of the year. Asdrubal Cabrera and Michael Conforto would both follow with singles that went against the shift—Conforto knocking in deGrom on his. That would be it for scoring, and after the fourth inning generally the last threat of until the eighth inning. Tyler Chatwood would settle in for the Rockies and record 13 groundouts in his seven innings of work. His ability to keep the ball on the ground really played into the Rockies shifting and kept the Mets from mounting real threats or taking advantage of the thin Colorado air. We’ll cover the eighth inning momentarily, but that will probably last as long as the Mets threat in the ninth. Maybe they had just seen/heard of the Blue Jays-Rangers brawl and they wanted to hop in, who knows. What we do know is that two pitches for Jake McGee equated to two outs, followed by a momentary interruption in the form of an Eric Campbell single, and finished off with a David Wright fielder’s choice ground out to Trevor Story. So about that eighth inning. The Mets were charging. There was one out. Juan Lagares and Yoenis Cespedes were on second and first base, respectively, and Lucas Duda hits a ground ball to third baseman Nolan Arenado. Lagares, trying to advance and avoid the force play at third, is called out by second base umpire Rob Drake for running out of the baseline. Here’s the problem: in an obvious effort to avoid the tag, Lagares literally took one step in on his way to third base. One step. He never left the dirt, or run all around the left side of the infield, or run over the fielder. One step. And it’s not like Arenado made an effort to tag him, either. He simply gave Lagares a courtesy look, and went to first base to record the out of Duda. There wasn’t a long argument, either, as that is not a reviewable play, so Terry Collins came out for a short conversation before quickly returning to the dugout. There’s no one play that can win or lose a team a ballgame, and there’s no guarantee that Lagares and/or Cespedes would even score should they have called him safe, but it definitely didn’t help the cause. I guess all you can do is say ‘oh well’ and move on. Jacob deGrom wasn’t at his best, but he kept the Mets in the game and gave them a chance. 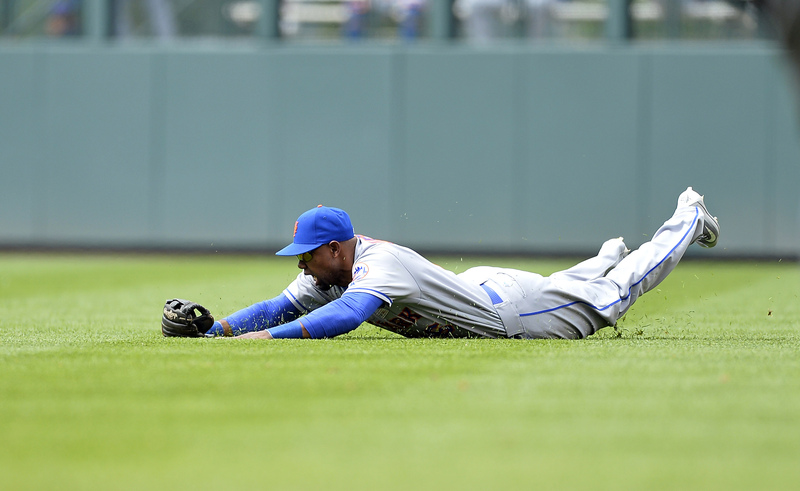 Offensively, the Mets started strong, but saw that fade as the game went on, and were ultimately hurt by a poor call. Those things happen, and there’s still a lot of season left, but this is one of those games you look back on nostalgically because it was very winnable. After being on the wrong end of a sweep in Colorado, the Mets have now dropped four straight and five of their last six. The long road trip is over, though, and New York is now faced with a small-but-meaningful homestand against the Washington Nationals and Milwaukee Brewers. Monday is a travel day for the Mets, and they’ll return to action Tuesday by sending Noah Syndergaard to battle Max Scherzer, as a series win pulls the Mets within a .5 game of the Nationals, while a sweep puts them ahead by 1.5 games.